08 Feb 2018 --- Just a few months before the UK sugar tax begins, Coca-Cola European Partners is making a move into plant-based drinks, with a new range, designed and marketed to appeal to millennials. 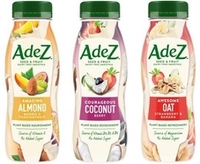 CCEP says AdeZ is its first ever range of plant-based drinks in Britain. They are made with seeds such as almond, rice, and oats, which are increasingly popular in the UK with the emerging category growing by 10 percent. AdeZ is CCEP’s first foray into the sector and has been developed with the ambition to make plant-based drinks accessible and appealing, helping retailers tap into the growing health and wellness trend. With no added sugar, AdeZ is a dairy-free smoothie which contains seeds, fruit juices and vitamins. The three-strong range is available in 250ml single-serve bottles, designed to be consumed on-the-go and representing a unique opportunity for retailers to build their on-the-go beverages and snacking offer in store. AdeZ will launch at the end of March with three flavor variants; Amazing Almond Mango-Passionfruit; Mighty Oat Strawberry-Banana and Courageous Coconut Berry. The launch will provide a choice for those looking for more options for varied nutrition as part of a balanced diet, says the drinks giant. As per the new legislation, from April drinks with 5g of sugar per 100ml will face a lower rate of tax, while those with more than 8g per 100ml will face a higher rate. The levy will only be applied to water-based soft drinks, while milk-based beverages and pure fruit juices are exempt. Amid a growing trend for healthy snacking, AdeZ is part of CCEP’s evolution as a Total Beverage Company, offering consumers more choice, in more ways, to meet their needs and desires at any time of day and on different occasions. “Consumers are increasingly conscious of their nutritional choices and lead busy lives, almost half are more likely to buy an item if they know the nutritional information,” says Simon Harrison, Customer Marketing Director GB at Coca-Cola European Partners. Earlier in the week, FoodingredientsFirst highlighted a plant-based beverage boom, you can read the full article here. Soft Drinks Adez Coca-Cola Smoothie Juice Seeds Dairy-Free Millennials Sugar Tax UK Levy Plant-Based Drinks.